Mar. 24 – Williamston officers are investigating a burglary that occurred last Tuesday morning (Mar. 24) on East Main Street in which the front door of Belk’s Jewelers was shattered and jewelry valued at $696 was taken. According to reports an adjacent business owner came into his business located next door at 7:30 a.m. and did not observe anything or hear any noises. Officers were dispatched to the scene at around 8 a.m. According to reports, items taken included a Speidel ID bracelet, $140; two Quality ID bracelets $224; Seven Speidel Leather bands valued at $114; assorted metal bands $59 and a Medical alert charm valued at $159. The incident remains under investigation. J. Taylor, M. E. Simmons, Det. Cremer investigated. Mar. 24 – Sharon Ann Smith, 38, 302 Byron St,. Williamston reported a personal animal trap valued at $150 damaged. The trap was found in a neighbors yard. The incident remains under investigation. M. E. Simmons investigated. Mar. 24 – Loretta Carolyn Wynn, 37, 129 Old Field Circle, Williamston was arrested for driving under suspension first offense after a tan SUV was observed on Anderson Drive with the driver not wearing a seatbelt. Wynn was issued a warning for the seatbelt violation and arrested for the outstanding warrant driving under suspension for an unpaid traffic ticket in 2002. J. Taylor investigated. Mar. 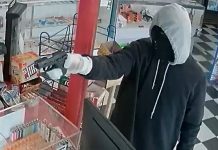 25 – Williamston officers are investigating the theft of lottery tickets from a local business. Officers were dispatched to Curb Market, 508 Greenville Drive. According to reports, a white male and a white female entered the store and while the white male distracted the clerk, the female took three unactivated books of lottery tickets. The male was described a 5’10” – 6’, approximately 190-210 lbs wearing a grey hoodie, blue jeans and a blue ball cap. The female was described as 5’3” – 5”5”, approximately 140-160 lbs wearing grey pants and a pink hoodie. The female’s left arm is amputated from below the elbow. Items taken included three books of lottery tickets valued at $75. Cpl. L. E. Mulz investigated. Mar. 26 – Smantha Lynn Turner, 35, 118 W 3rd St., Williamston reported two tires on her vehicle flatened after apparently being cut by a sharp edged instrument. K. S. Looney investigated. Mar. 27 – Faye Lawrence Dean, Jr., 53, 26 Parker St., Williamston reported an 18 volt Dewalt Drill valued at $200 stolen from an outside closet attached to a carport. J. Taylor investigated. Mar. 27 – An anonymous caller reported finding a foot marker from a grave stone that had the words “Baby” engraved on it. The item was found on Circle Drive. It was placed into evidence and officers will check the Williamston Cemetery to see if they can locate where it came from. Sgt. K. J. Winn investigated. Mar. 27 – Tevin Jarrod Lindsey, 24, 199 Mill St., W. Pelzer was arrested for simple possession of marijuana after officers were dispatched to E. Caroline St., in reference to a black male with dreads selling drugs inthe area. T. L. Eichelberger investigated. Mar. 28 – Bobby Todd Rogers, 33, 147 Eastview Rd., Pelzer was arrested for possession of methamphetamine, possession of drug paraphernalia, driving under suspension third offense and providing false information to officers after a white Ford F150 was observed with the driver not wearing a seatbelt. During a search of the vehicle, officers found methamphetamine within arms reach of the driver in the vehicle. J. Taylor investigated.